Today, my kids asked me to post about their favorite salmon recipe – my Honey Lime Salmon. Roasted salmon is a great meal option for us on busy days when I’ve had little to no time to prep because it cooks up so quickly. Salmon in generally is usually a great meal option for those busy days, but my Honey Lime Salmon is just perfect. It’s easy to prepare and needs only a handful of ingredients. They’re things that I often have on hand, so it’s a great one when I’m in a rush but still need that healthy dinner option. With very little fuss, I can get a healthy and delicious meal on the table that the whole family enjoys. It’s a win-win. Since I frequently make this Honey Lime Salmon when I’m short on time, I always am looking for ways to capitalize on my meal prep time. I like to keep the meal prep and dishes to a minimum and this is the perfect recipe for that. Not only is it ready to cook in 5 minutes, but it’s one that can easily become a one pan meal. I’ll frequently toss some chopped veggies on the pan with the salmon. Any extra honey lime sauce that I may have will get tossed in with the veggies to give them that same delicious flavor as the salmon. It’s then basically a one pan meal with less fuss and clean up! If I’m looking to add some carbs to the meal, serving the salmon with a side of fresh steamed rice or quinoa is a perfect way to add a few carbs without adding much extra work or dishes. The beautiful coral colored salmon is a magnificent main dish that’s always fun to pair appetizing sides to. There is something about the color of salmon that really adds a beautiful flair to the meal. I like to try and keep my meals colorful, and it’s pretty easy with salmon. Balsamic Garlic Roasted Green Beans and Mushrooms is one of the most popular recipes here on the blog and with good reason. It’s quick and easy, delicious and the bright green beans are a perfect side to the salmon. If you’re feeling more like fresh veggies, try the Simple Kale Salad recipe that will add a pop of fresh, crisp veggies to your meal. My Quinoa Tabbouleh Salad is another great side dish for this amazing and juicy salmon. It’s delicious and filled with color between the bright green herbs and the fresh red tomatoes. If you’re roasting some veggies with the salmon, this Quinoa Tabbouleh is a great way to add a side dish with some carbs that still has plenty of fiber and protein. Honey Lime Salmon is definitely a favorite in this house and it’s easy to see why. The tender and succulent salmon with the tangy-yet-sweet honey lime sauce is simple and easy. It’s ready in less than 30 minutes and goes with practically anything you’d like to put it with. 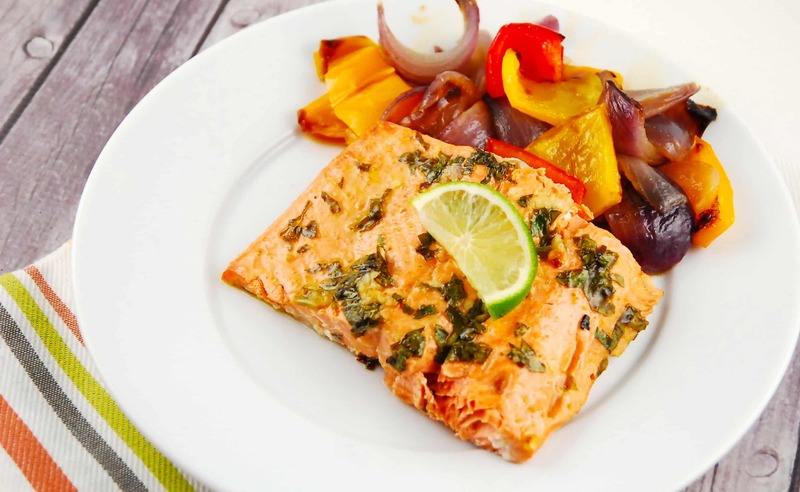 The lean salmon is a fabulous source of protein that’s loaded with those heart healthy omega fatty acids. This is such a tasty and easy meal, you’ll find this recipe becoming one of your go-to’s. A simple, yet delicious salmon recipe that gets dinner on the table in 15 minutes. The tangy honey lime sauce is the perfect compliment to the bold flavor of the salmon. Preheat oven to 400. Line a baking sheet with parchment paper or mist with cooking spray. In a small bowl, whisk together remaining ingredients. Place salmon on baking sheet and brush with sauce, making sure to coat each piece evenly. Roast salmon in oven until cooked through, about 10-12 minutes, or until salmon is cooked to your liking. Remove from oven and serve with lime slices.